Take a look at the graph below of the economic performance of the major oil-rich nations of the world over the past 30 years. The divergence is startling. In this case, “major” is defined as a population exceeding 3 million. “Oil-rich” means that oil exports account for more than 10% of economic output. And because the timeframe is 30 years, there are a number of countries that are too new to not appear in the chart. These new countries include Azerbaijan, Turkmenistan, Kazakhstan, Equatorial Guinea, and, topically, Russia. How will Russia do after Sochi? If we judge by the record of the past 30 years, there are two starkly opposed possibilities. One is the Norwegian option. Oil wealth was turned into capital investment, and capital investment was turned into greater output, year after year, until Norway was one of the world’s richest nations. Norway is not just a success compared to its oil-rich peers – and in cross-country skiing. Norway’s economic performance, measured in terms of absolute addition to income per person, is the best of any large (population 3m+) country on earth. 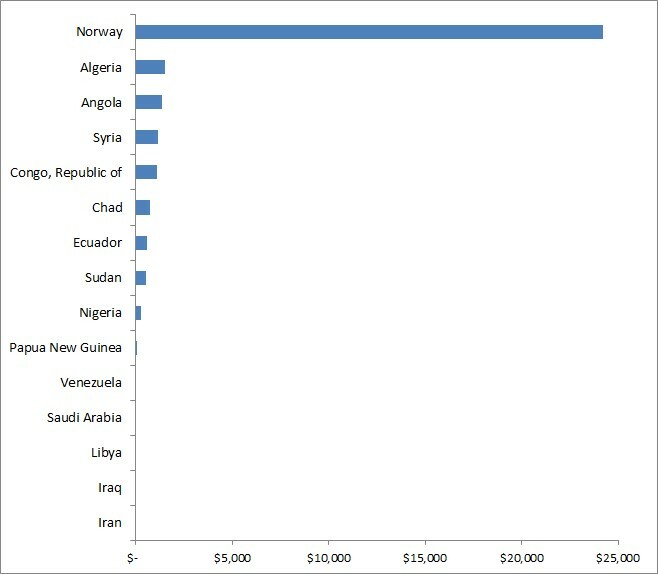 The other possible route is the one taken by every other major oil-rich nation in the world aside from Norway, without exception (see graph). That is, over a 30 year period, of a negligible increase in wealth, or indeed – in the case of countries including Iran, Iraq, and Venezuela – the net destruction of wealth. How does this happen? There is no universally accepted explanation. Oil appears, in some cases, to fund civil wars, thus increasing the length or perhaps likelihood of violent conflict. Oil appears to be an impediment to the growth of exports, and perhaps also to the growth of democracy. But for one reason or another, there does not seem to be a middle ground. Either leaders invest materially all the nation’s oil money in the furthering of economic progress (like Norway), or they fight over it, whether through corruption or war (like everyone else). These approaches seem to be mutually incompatible. And worryingly, the Russia of the present day does not much resemble an emerging Norway. But let us end on a slightly more hopeful note. In one important way, Russia is very similar to Norway, and very different from every other country on the list above: that is, its people are highly educated. Indeed, in terms of the stock of university-level education, Russia actually beats Norway – and not the Norway of 1980, but the Norway of today. The average Russian has spent more years in university than the average Norwegian. These educated Russians are not only potentially productive, they are potentially powerful, capable of concerted political action – admittedly, in today’s Russia, at great personal risk. And so: it is stating the obvious, but if Russia is going to change its path after Sochi, it is up to the Russian people to do it.